They say time is money, but that’s not true. Time is life. What’s life like if you have to spend it clicking through software and copy pasting things from here to there? We continuously work on improving Salesflare and adding new features, so that you can spend less time with software and more time with your customers. And even if time was money, we’d help you save and make more! Wish you could explore each of your opportunities with just one click? Explore your pipeline faster through this new sidebar. Want to click to the account timeline from here? Hit the account name at the top right. It now also shows more clearly what field needs updating when the red corner on the opportunity appears. Up till now you could see who opened and clicked on your email campaigns, but not who replied to them… at least not without checking every timeline separately. Track who has replied, or hasn’t. Send emails straight from there. You can even start a follow-up campaign straight from there! Want to create a campaign today and schedule it for tomorrow? 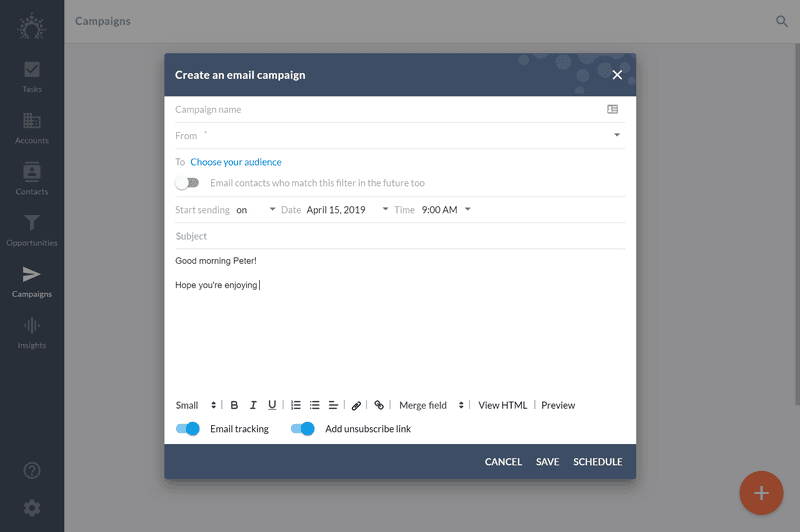 Schedule email campaigns for any moment in the future. We improved fixed the bugs you reported, tweaked some app flows, and much more. As always, keep the feedback coming through the live chat — we thrive on it! Ready to power up your sales? Give Salesflare a try. We’re an easy-to-use sales CRM for small B2B companies that’s chock-full of automation and always up to date! We hope you liked this feature update. If you did, follow us on social media!